To wish you a happy day! Happy Monday all! This is my first entry for Embellish Magazine’s Ribbon Color Challenge. I wanted to create a versatile card that can be used for any special day and I happen to LOVE this SU Stamp Set! 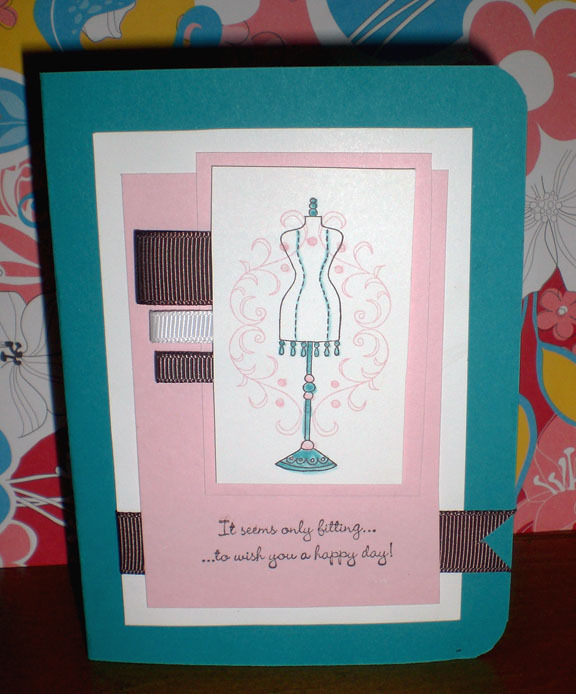 Stampin’ Up!’s tempting turquoise, chocolate chip, pretty in pink were my color choices for the challenge. I used some chocolate chip and white whisper ribbon, and of course the fabulous “Chic Boutique” stamp set! I love retro styles and my bathroom is actually decorated with the same french boutique theme! OMG I love that stamp!! I just bought myself one of those full size dress form thingy's for my craft room so the stamp really caught my attention. Very cute ribbon pulls! Thanks for taking an Embellish challenge. What an awesome card! LOVE it!!! Very nice! Thanks for playing along with us! Hey Karrianne, what a gorgeous card! 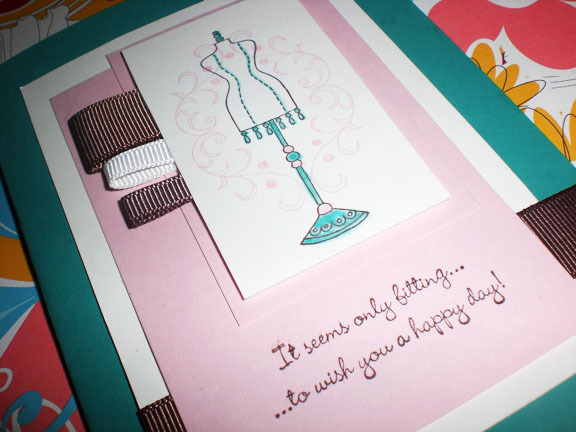 Love your use of the ribbon, so glad you could join us over at Embellish. Can't wait to see what you do with Dawn's sets! Hello, GORGEOUS! Not only is that a beautifully stamped and embellished piece of fabulousness, but I love the background flourish, just perfectly positioned for utmost dreaminess! Fantastic work, Kerrianne! Ooohhh! So pretty! And I LOVE your blog! I LOVE your style, girly! Thanks so much for playing along with us!